As the medieval churches of central Norwich fell redundant during the course of the 20th Century, so they met with fates of varying degrees of kindness. None suffered the indignity of demolition, other than most of those destroyed and damaged by the Norwich blitz, but conversely only a few have retained any liturgical integrity. For the others, their furnishings were often rescued, and placed elsewhere in the city according to demand and suitability. Thus, St George Colegate now has one of the best collections of Georgian furnishings in Norfolk, augmented from elsewhere in the city, and St Julian, rebuilt in the 1950s, also benefited from the fixtures and fittings of several Norwich churches, including the fabulous font from All Saints, There were adornments from elsewhere for St John Timberhill and St George Tombland, among others, and when the church of St James the Less fell into disuse after the Second World War, its more significant furnishings were moved a short distance up the hill of Silver Road to to the modern church of St Mary Magdalen. A little over sixty years later, I retraced their steps. St James is now the Norwich Puppet Theatre - I had explored it when I had visited all of the medieval churches of central Norwich back in the autumn of 2005. But after that, I am afraid that I somewhat neglected the Fine City for the wilder backwaters of its rural county. However, in January 2009 it suddenly struck me that this would be the ideal time to renew my assault on the city. I was well over halfway through revisiting the churches of Suffolk, and I could afford to take my foot off the accelerator there; and, although there were still about fifty rural Norfolk churches which I needed to visit, most of them were over in the far west, and the days simply weren't long enough to get out there and see them. I was also wary of cycling off into the back of beyond when the weather forecast was so foreboding. Thanks to the swiftness and frequency of the fine rail services offered by National Express East Anglia, Norwich is less than an hour from my house, and when the last Saturday in January 2009 promised bright sunshine but sub-zero temperatures, it seemed as though the weather and the city were made for each other. 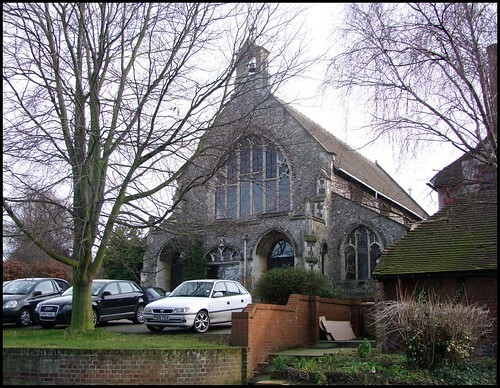 St Mary Magdalen must be considered a suburban church, but it is in fact very close to the city centre. At the bottom of Silver Road, mad Herbert Rowley's inner ring road bursts through the medieval city wall, and you climb up through rows of 19th Century red brick terraces. The first church you come to is not this one, but a fascinating Byzantine Baptist church of 1910, unaccountably neglected by Pevsner. A little further up the hill, almost at the top, St Mary Magdalene sits back from the road. As I approached, I could see that the small car park in front was full of cars, and at first I wondered if something was going on in the church. But then I noticed the Weightwatchers Club placard at the entrance to the extension. This extension is very good, about 1970 I should think, with meeting rooms, kitchens and forming a kind of cloister down the north side of the church. As if to echo and complement it, the south side has been opened up with what can only be described as patio doors (how did they get past the Diocesan architect?! ), but generally it is all harmonious, and works very well. St Mary Magdalen dates from 1903, and was the work of diocesan architect AJ Lacey. It is an elegant church, a world away from the ponderous exercises in neo-Norman which his predecessor Herbert Green was imposing on the diocese only a decade or so earlier. It has much in common with Charles Spooner's Ipswich St Bartholomew, with which it is almost exactly contemporary. The use of a wide open interior broken up by two arcades to create aisles, with a clerestory above, is a conscious echo of the traditional medieval East Anglian church, but is also a reference to an Italianate basilica, a form thought proper by the early 20th Century Anglo-catholics. The west frontage, meanwhile, is nearly identical to that of St Cuthbert, a mile or so up the Sprowston Road, a less interesting church, but one which predates St Mary Magdalen, so the arrangement must have been thought worth repeating. There are two doors separated by what appears to be the church office. However, the main entrance to the church is now through the northern extension - as, ironically, it is now at St Cuthbert. The interior of St Mary Magdalen has been considerably reordered since the medieval font and rood screen came here from St James in 1946. Today, the congregation sit in modern chairs, whch always looks good in a church, although in this case the effect is a little marred by the retention of banked pews at the back of the church. The screen once ran across the last bay but one to the east, but the panels are now exhibited on the south wall. They are very beautiful, although perhaps a little more restored than Pevsner and Mortlock allow. The artist may well have been the same as at Old Hunstanton. There are ten panels, and the Saints depicted appear to be St Barbara, St Sitha, St Agnes, St William of Norwich, St Joan de Valois, St Martin, St Blaise, St Walstan, St Helen and St Nicholas. The font is set neatly on a pedestal beside the south arcade. It seems unlikely that this is where it would have been put originally, so I wonder if it has also been moved since 1948. It has similarities with that at St Julian now. Apostles stand in pairs around the bowl, while the stem is flanked by eight female Saints - St Helen, St Etheldreda and St Anne stand out. The foliage under the bowl is proto-Renaissance in style, showing that this font, like the screen, dates from the early 16th Century rather than the 15th. The east window is filled with clear glass surrounding the central figure of Christ the King, an excellent setting, and a fine piece of work, I assume by the King workshop. But this is not the only glass of interest. While the font and screen are well-known, and I'd been expecting them, I hadn't expected the interesting collection of roundels, figures and fragments in other windows. Some of this is Continental glass, including an excellent Dives and Lazarus, and a rather gruesome mass martyrdom scene. But it is the English glass which is the most interesting. The most striking figure is that of St Barbara holding her tower, and it took me a moment to decide that it is probably a modern replica, possibly also by the King workshop. But the heads of St Agnes (a gory dagger puncturing her throat) and St James (a jaunty seashell on his hat) are medieval, surely? And if so, where did they come from? I could find no mention of them in Ann Eljenholm Nichols' Early Art of Norfolk, a book which I have come to trust as the single most reliable guide to the medieval glass of the county. Did they also come from St James? Pondering this mystery, I continued my journey up the hill.